Watch Tapatan ni Tunying on May 1 featuring his visit to Gensan to trace Manny Pacquiao’s roots. 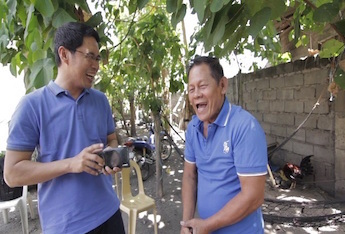 [dropcap]T[/dropcap]omorrow, Friday, May 1, 2015, exacly two days before the Manny Pacquiao and Floyd Mayweather, Jr. fight, broadcast journalist Anthony Taberna aka Tunying, flies to the Tuna Capital of the Philippines to trace Pacman’s roots and talk to the people who were with him at the first stages of his career. In tomorrow’s (May 1) episode of “Tapatan ni Tunying”, Pacman’s brother Domingo Velbestre and sister Lisa Velbestre-Onding attest to the story of a young, poor boy who turned to boxing as a means of ensuring a better life for his family. First to buy him a pair of boxing gloves is Manny’s uncle, Zardo Mejia who would later guide him during his initial amateur bouts. Zardo has wisely kept Manny’s first boxing gloves. “Importante sa akin ito kasi may sentimental value ito kasi ito ang unang gloves na binili ko na ginamit ni Manny. Hindi ko akalain na siya ay magiging sobrang sikat na at saka naging congressman pa,” Zardo says while showing his prized items. Kuya Tunying also interviewed this author’s nephew, Michael Bren Manansala Evangelio, Manny’s congressional chief-of-staff, about the boxing champion’s work ethic, and Manny’s spiritual counsel Pastor Jeric Soriano about Manny’s big spiritual transformation. Watch “Tapatan ni Tunying” tomorrow (May 1), 4:30 PM on ABS-CBN’s Kapamilya Gold. For updates, follow the programs social media accounts www.Twitter.com/TNTunying, www.Instagram.com/TNTunying, and www.facebook.com/TNTunying.